The UI is back in business and has been updated for patch 7.3.5.
please make sure to check the FAQs first. Copyright © 2014-2018 Yves Petsche <[email protected]>. For more information, take a look at the LICENSE.txt file included in this AddOn. 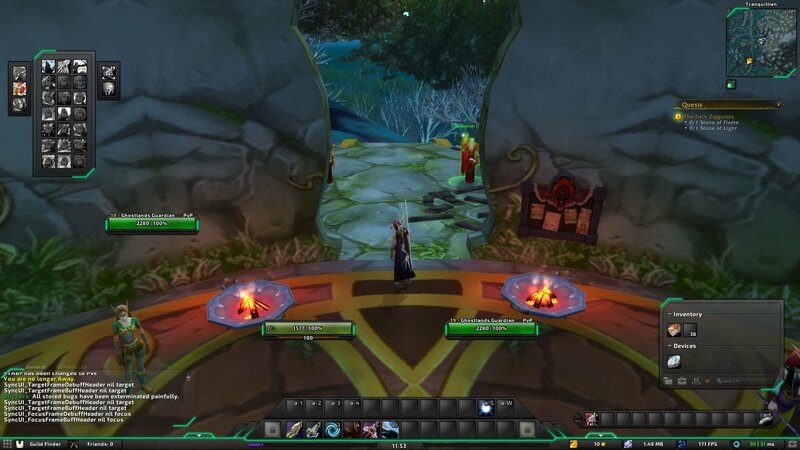 Love the UI, one of my favorites by far, but looks like 8.1.5 busted the bags, mouse over buffs and debuffs. 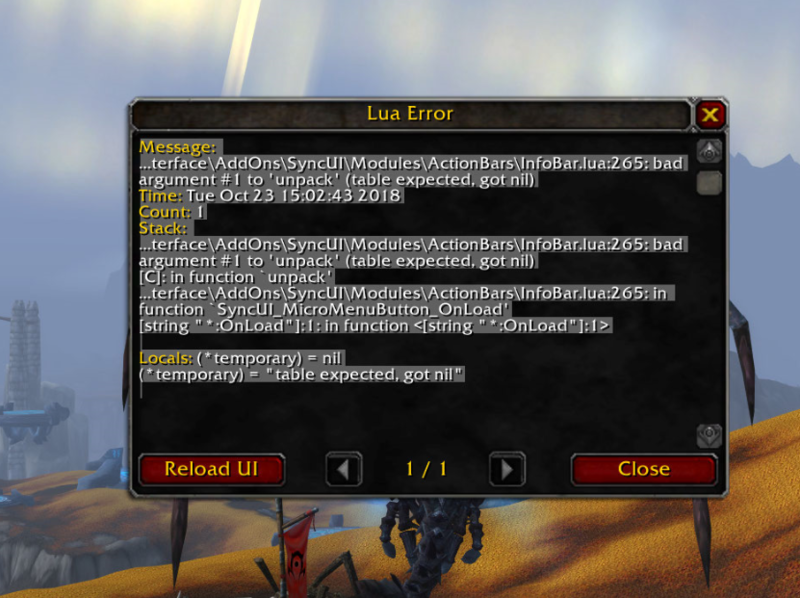 sadly the bags doesnt work since 8.1.5.
would be great if you would update it. (*temporary) = "table expected, got nil"
Darkraven83 Thanks a lot for the tip, I'll try to use it this way, but it would be interesting if in the future it puts up such a specification, I love this addon since its launch and have waited all the time for its return, but I miss some features. But thank you very much for the tip, I tried through the LUA. make such a modification, but always have some bug of missing the buttons or simply lock. If anyone knows and can help, thank you in advance! Hello Syncrow, I'm too fan of your UI, is there any way I can take the SIDEBAR and use Vanilla's. This Sidebar bothers me a little in the use, I would like to leave the old bars, those that were in the corner of the screen on the right side again, is there any way? personally i get by now that it stops at the 1st and 3rd bar it used to repeat the cycle never ending. not good when mouse has hyper-scrolling. i wish i knew lua. however you could always download bartender4 and disable all bars except for 3, 4, and maybe 5. then just click that arrow toggle underneath the sync sidebar to hide that. I can make several modifications for personal use, but I can not get this bar on the side and put the old ones that were in the right corner, is there any way? I keep getting a error when I log in. Also the talent tree is still not working. Hey, let me start by saying I love the UI! Been using it on all my PCs since discovering it. Is there a way to use a action bar addon? Don't get me wrong, I quite enjoy the setup as is but unfortunately is inconvenient when on my main rig. I prefer my main actions bars be 2 bars that are three rows of four icons each and mapping them to my Nostromo and Naga. If this is something that is possible would love to know how!!! Nice UI. Not a huge fan how the bags are setup. Is it possible to change the bags like how ElvUI has it? Its easy. Go to Addon folder, the Modules folder and then Edit the Modules.xml file with a text editor (like Notepad+). Comment out (green words) the modules you dont like and then use an addon for them or default blizzard. For example I commented out Bags, Talents and Talking Head. Last edited by bravejohn : 10-16-18 at 07:17 AM. hello, is possible put current HP on Nameplate? danke, dass die Auren angepasst wurden. ist es möglich die Hots, Schilde etc im Heiler-Mode anzeigen zu lassen in den kleinen unit-Frames? Und als Bonus-Frage kann man das "Druiden-Gestaltmenü" (Control-F1 etc.) auch irgendwie dauerhaft einblenden lassen? First of all, thanks for this wonderful GUI. But when I use macro, the button wont glow when spells trigger like "Massacre" of warrior. Can you help to fix that?